Between the Egyptian statue of Darius the Great and the find from Deve Hüyük, I now believe a recreation of the so-called Elamite dagger is entirely plausible as well as not too expensive - and that's just what I'm doing! This will be a slow and laborious process and could take the better part of a year. I'm also bogged down with trying to get as much woodworking done as possible right now that necessitates shop equipment, since I probably won't be taking any classes next semester. This project owes much to the work of Matthew Amt, who two years ago demonstrated that an iron Naue II could be created from mild steel using only an angle grinder and hand tools, as opposed to the more expensive bench grinders and belt sanders normally used in making blades by stock removal. If you have boundless stamina, I expect you could do the same with just a hacksaw and files. Again, this is something I lack, so power tools will be necessary. The project starts with a paper pattern. 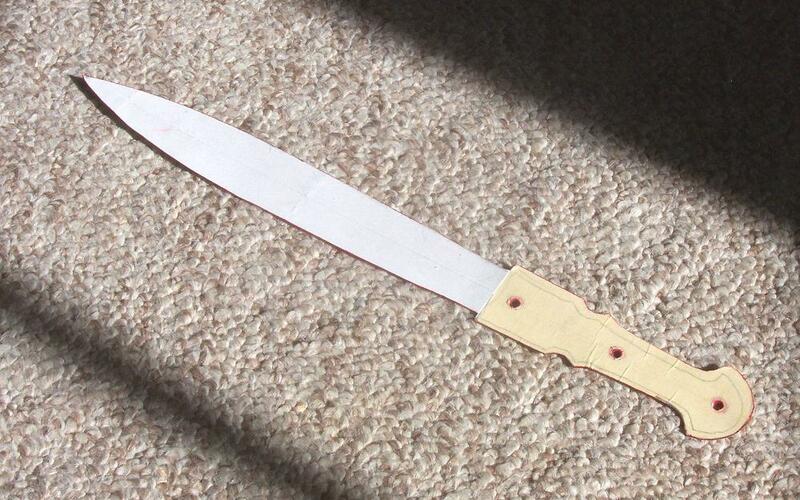 I first scaled the image from Halehs World of Archaeology on my computer (according to Roger Moorey's catalogue, the blade, including tang, is 31.9cm long). I made a rough tracing of the hilt, folded it in half lengthwise and made a nice smooth outline, then added about an eighth of an inch as the raw material for cold-hammered flanges (this is also acting on Matt's advice). The blade was done separately. Since the original is badly distorted from damage and/or corrosion, I just sketched the blade from measurements, and added about half an inch to account for damage to the original's point. It may be a slightly different shape from however the original was shaped; I don't mind. I know from photos that it is within the range of shape of well-preserved bronze originals. Once the paper patterns were cut out, I glued them onto card stock using a gluestick and cut them out again. I also twirled out the rivet holes with the angled blade of an X-Acto. Next, the pattern is mounted onto some mild steel bar stock with mounting putty, and traced in permanent marker. This is 1/4x1.5x36-inch stock, which should provide plenty of material for both this and a new akinakes blade when I get around to it. I have no idea of the alloy; as a rule, though, chain hardware stores in the U.S. don't carry high-carbon or stainless steel in bar stock form. No heat treatment will be assumed; ideally, I'll just hammer-harden the edges. En suite with the angle grinder, of course, goes my trusty splash goggles and a pair of leather gloves. I have no protective apron, so I'm just trying to stand and hold the grinder to avoid most of the sparks. And there are sparks, not as much as with high-carbon steel, but definitely more than I'm comfortable having rain onto my trousers. I have to work outdoors, and after the initial cuts I realized ear plugs are necessary. Above, the outline is maybe two-thirds done over three roughly 45-minute sessions, mostly using the grinding disk that came with the machine, with, of course, the larger chunks removed with a standard cut-off wheel. Using the angle grinder is easier but more tedious than I anticipated; it's like gradually erasing metal. Between sessions, I've been smoothing out the edges and getting rid of the ragged fringes with a file to make handling the blank safer. I drilled the holes for the tang with one of my school's drill presses (using my own drill bits, of course - I don't like the thought of being yelled at for using woodshop equipment on metal) and cleaned them up with a Dremel cone cutter. One interesting result that I've noticed so far is that assuming I understand Moorey's measurements, the hilt is tiny, and far too short to function the way I thought it would. I thought that all five fingers would rest between the pommel and guard, like on a modern qama (which this little sword greatly resembles), with the thumb and forefinger occupying the finger notches. Instead, the thumb and forefinger can only simultaneously pinch the notches if the pommel is completely within the fingers, resting against the heel of the hand and between the little and ring fingers. If I choke up on it so that the pommel's outside my fingers and lower on the heel, my thumb and forefinger are now pinching the guard, with my middle finger in one of the notches. 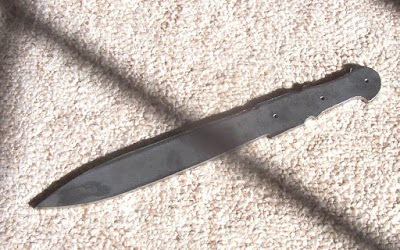 Perhaps corroborating the latter usage is the fact that on several other daggers of this type, the sides of the guard are concave. Meanwhile, the card pattern can also be used for preparing the scabbard parts. 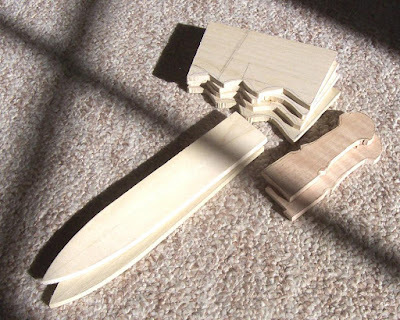 Possibly the original was made of just two pieces of wood, but because this would require a lot of material removal and leave the wide side of the throat a bit weaker than ideal due to its grain being shorter than the throat is wide, I'm making it instead from multiple pieces of 1/4-inch poplar (aka American tulipwood). I chose poplar because what with the sharp angles, I don't think these scabbards had an organic facing, which would either have to be made in multiple pieces (and perhaps stitched?) or get scrunched around corners. For a simple scabbard which will be faced, basswood is acceptable, but it (or at least the kind we get in the States) strikes me as too soft and weak for a bare wood scabbard. Harder woods may be more durable, but are also more expensive and difficult to work. Poplar provides a nice balance of physical qualities. It belongs to a different species - a whole different order, in fact - from the poplars of Eurasia, and its color is usually unattractive (though can be quite beautiful), but I plan to paint it, so I don't think the species matters so much, since neither its color nor grain will be viisble. Alongside them, I cut a pair of curly maple scales. I later got some black walnut, which would possibly be a little more appropriate (it's not the right species, but walnut grows throughout Iran while maple grows only in the north) but I'd already cut the maple by then. Oh well, at least the curly pattern is nice. Good job Dan! Looking good. Thanks. I must admit I've had a soft spot for these little leaf-blades for many years. Maybe someday I'll have an older-style one cast from bronze.